Well, I have to admit. 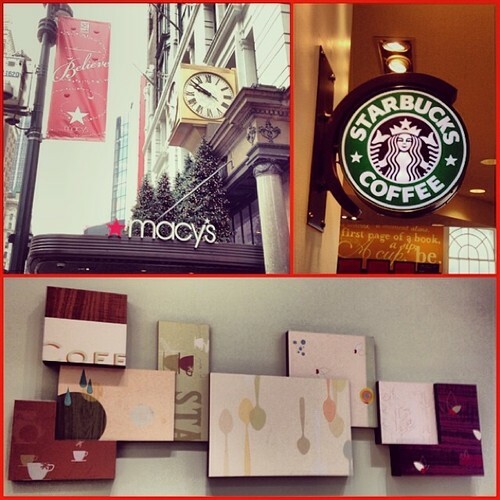 I came to Macy’s today with a plan: Visit the four Starbucks inside starting from the top and work my way out of the massive store in time to meet some friends for brunch. I started with a latte at the 6th floor Starbucks, quickly followed it with a double shot of espresso at the 5th floor Starbucks, took my time sipping a tall pike in the 3rd floor Starbucks’ generous seating area, and then arrived at the first floor balcony Starbucks with just enough room in me for another double shot. What I did not expect was to be told by one of the baristas at the balcony location that there is actually a 5th Starbucks cafe inside Macy’s on the the 2nd floor. Hell, I thought I was technically on the second floor! But no. When I asked about the supposed “Evening Menu”, I was told I would find it at the 2nd floor Herald Square Café. Needless to say, I quickly downed my double shot, cut through the perfumes and headed back up the escalator. And there it was, right on the Broadway side of the building in the corner of the women’s shoe department. I had literally passed by it on my way to the 6th floor earlier and not even noticed. Why? Two reasons: they do a good job at distinguishing it from the rest of the merchandise, and there is technically no Starbucks branding on any of the signs. None. As you can see above, all signs read: Herald Square Cafe. Now before you go jumping to any conclusions, this is not like your typical Barnes & Noble Cafe that happens to serve Starbucks coffee. This is a truly unique experience altogether. 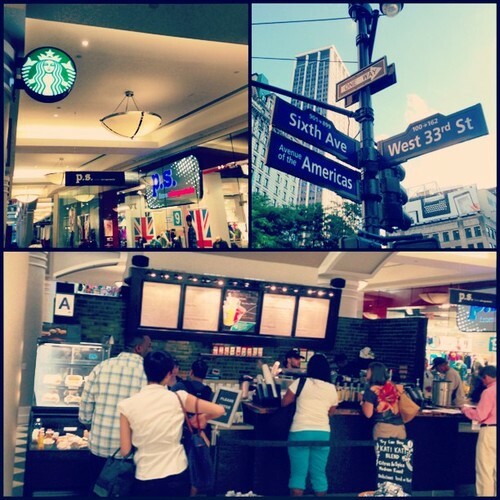 So yes, this location is called the Herald Square Cafe, but it is owned by Starbucks. Some have called these kind of stores mercantile or non-branded, but honestly the coffee cups are still typical Starbucks red-cups, so it’s not that sneaky. Yes, there is also an evening menu that includes champagne and wines. It also has some pretty neat food options like truffle oil mac & cheese and hand-crafted chocolates, but honestly my mind went straight to the fact that they serve alcohol. I wonder what that says about me? Anyway. The seating area — in fact, the entire cafe — is very elegant and classy. The tables and chairs are composed of marble and wood. The sofas are upholstered with a dark grey floral design, and there is a beautiful clock fixture mounted on the wall that represents Macy’s exterior clock that overlooks Broadway. Well , I must admit I probably looked like a crazy person. Here I stand, a Starbucks enthusiast hyped up on 2 double shots of espresso, a latte and a coffee, standing in a newly discovered and very unique Starbucks that serves champagne and brings your food to your table. So what did I do? I ordered myself a brut rosé, sat down at one of the extravagant sofas and simply allowed myself to relax for a moment — a long moment. I sipped my champagne and thought how cool this past year has been and how I’ve enjoyed discovering places like this around the city. 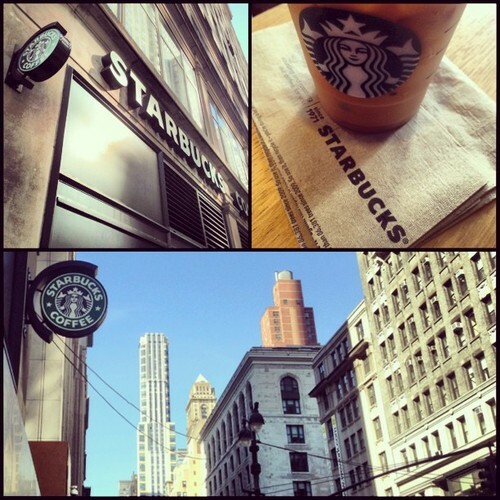 I know New York is not for everyone, and I know there is much more than Starbucks in New York. But this experience really has led me on quite the journey. Those are just a few of the thoughts that came to mind before I finished my glass and walked out of the Macy’s Herald Square and its five distinct Starbucks within. The balcony Starbucks at Macy’s Herald Square is definitely impressive. It actually got renovated this year and was closed for several months. But obviously Macy’s and Starbucks made sure it was all shiny and new before the holiday season. The balcony floor is also know as floor one and a half, and it overlooks most of the women’s perfume and jewelry department, which is by far the busiest section of Macy’s all year round. Luckily, the renovation seems to have added more seating and more style to this Starbucks. Now there are cushioned seats, mini tables, and dividing wall units that do a descent job at separating the Starbucks lounge from the crazy crowds. And yes — the crowd is crazy. I’ve waited in line at this Starbucks for over 15-minutes in the past. But fortunately today I caught it at a good time and waited only 2-3. I thought this location was the only one in New York to offer what Starbucks calls their “Evening Menu” that includes champagne; however, the barista informed me this is not the case. 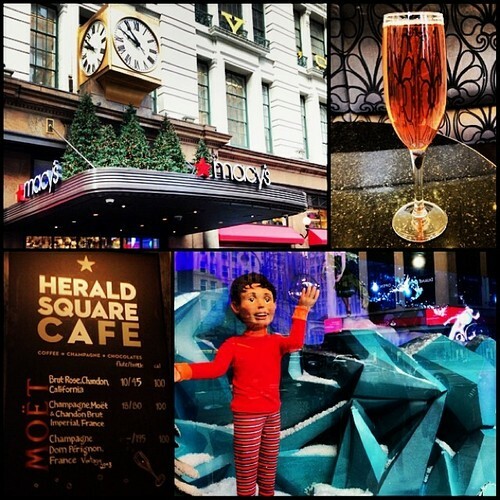 He said there was another Starbucks on the 2nd floor of Macy’s that is known as the Herald Square Cafe, and I could get champagne and wine up there. 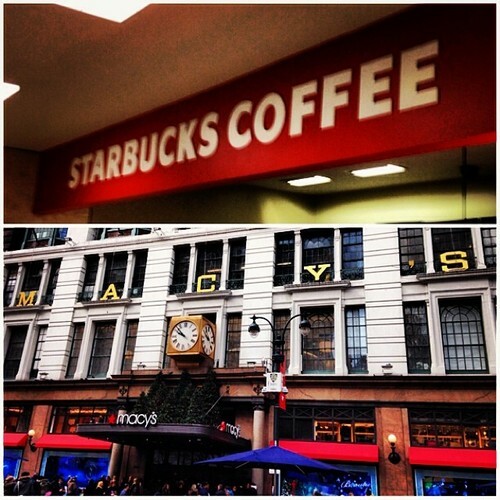 Here, I thought there were only four Starbucks in the Macy’s Herald Square, but technically there are five. So clearly my exploration of Macy’s is not over just yet. After visiting the Starbucks on the 6th and 5th floors of Macy’s, I’ve now made my way down to the 3rd floor Starbucks. This location differentiates itself from the others because it actually has seating. It’s not simply a Starbucks counter like the others. It is set up in the corner of the floor and is completely distinct from the surrounding Macy’s merchandise. It even has different floor tiling and a half wall dividing it from the 3rd floor women’s department. There are a handful of tables-for-two, a sofa with power outlets, distinctive Starbucks decor and it even gets natural sunlight from the windows behind the barista bar. Unfortunately, it’s closer to the ground floor so it is also more traveled than the Macy’s Starbucks on the higher levels. After visiting Macy’s 6th floor Starbucks, I simply had to take one escalator down to the 5th floor woman’s department to find the next one. And I have to admit, these two Starbucks are strikingly similar. They are the same exact size. Neither offers seating. And they are both located up against a wall that separates one department from another. The only perceivable difference is that this 5th floor Starbucks is surrounded by woman’s clothing and not bedding. I simply ordered my double shot of espresso, took in the scene and continued on my way. 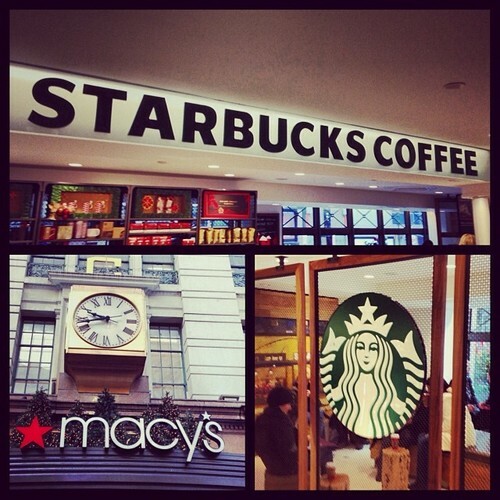 There are grander Starbucks inside this Macy’s to visit. I know that for a fact. Macy’s. A joy to some. A burden to others. The Macy’s at Herald Square is a lot of things. It’s currently the world’s largest department store. It is the company’s flagship store. It is a New York landmark and central part of a national Thanksgiving tradition. It’s also one of the first buildings I entered when I first visited New York. What can I say? I was simply drawn to it. I mean — come on — with 10 complete levels of shopping, it’s any gay man’s dream store. The massive department store was actually located directly across from the hotel that my friends and I were staying at, and it caused many directional conundrums. Everywhere I went in the area of Herald Square I saw Macy’s. I’d think I was close to my hotel, when really I was 2-blocks away. But Macy’s can also be a total stressor — especially around the holidays. When you’re trying to find that special something for that certain someone, and thousands of others are in the same department store doing the same, it can be a complete nightmare. Take this morning for instance — I arrived at Macy’s around 9:40am and realized the store doesn’t open until 10am today. However, there was already a sizable crowd waiting at each and every entrance. And it just kept on growing. Once the doors opened, everyone plunged in and scattered for the good sales or to see Santa on the 8th floor. I — however — just laid back, took it all in and casually strolled to the first of four Starbucks I plan on visiting today. Yes. 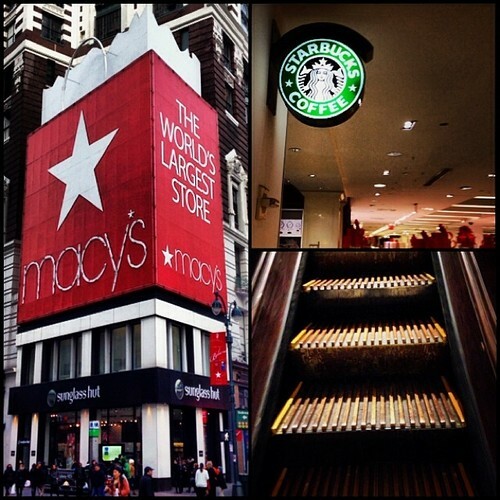 There are four Starbucks in this Macy’s alone: one on the 1st floor balcony and one on the 3rd, 5th and 6th floor. In fact, there are more here than in Grand Central, Penn Station or any other New York building. And why not? WIth all that stressful shopping, people need a pick-me-up – or two, or four. In order to efficiently visit all of the Macy’s Starbucks, I decided to start from the top down and made my way to the 6th floor location. Something worth noting is that after the 5th or so floor the escalators in Macy’s turn from metal to wood. You can see the wooden escalator pictured above. I’ve never seen anything like it. Anyway… on to the Starbucks. The 6th floor Starbucks is located in the bedding department. There are no seats or separating walls for the Starbucks. It is simply tucked into one of the walls. When I arrived there was no line — but I can tell you from experience, that even though this Starbucks is the highest in Macy’s it can still generate quite the crowd. So I simply ordered my eggnog latte, paused a moment to fully take it in and then moved on. I’ve got more ground to cover! I consider the corner of 34th and 7th Avenue to to be the epicenter of Midtown, Manhattan. It’s just west of Macy’s; just north of Penn Station; and a few blocks south of Times Square. Buses heading out of the city (if not going through the Port Authority Bus Terminal) often pick you up and drop you off on this street, and it’s surrounded by hotels in every direction. But what does all this say about the Starbucks that exists on this corner? Three words: busy, crowded and cramped. This Starbucks is narrow in structure, but that kind of works for this location since it has both a street entrance and exit into an office building; so in theory, it serves its purpose for all those who work in that building. Unfortunately, for everyone else, this Starbucks’ structure is much more frustrating than convenient. There are six tables lined up against one wall. Each of those are crowded with patrons and non-patrons. Actually, a lot of people are on laptops with no coffee in hand or simply sitting and staring blankly with luggage by their side. Each time one person leaves, another person that has been standing and waiting rushes to the empty seat. So — yeah — this Starbucks may be in the epicenter of Midtown Manhattan, but that only means it takes the crowd of two Midtown Starbucks. New York City is known for some of the best shopping opportunities in the country. However, one thing NYC is not known for is its malls. After all, this isn’t Minnesota. Where other cities rely on malls to bring the people and retail chains together, here in Manhattan, clothing stores and specialty shops can thrive without the confines of a shopping mall. However, there is at least one mall on the island of Manhattan that I’ve stumbled upon, and that mall, of course, happens to have a Starbucks in it. The Manhattan Mall is just south of Herald Square and rests in the shadow of the gigantic Macy’s. It consists of your typical, run of the mill mall stores like Victoria’s Secret, JC Penney’s, Express and Aeropostale, but is lacking the typical mall food court. The mall is typically flooded with Midtown tourists and a younger crowd of high school mall-rats with nothing better to do — oh the memories! 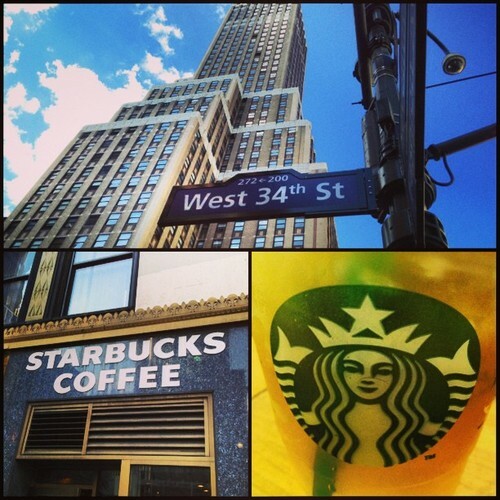 The Starbucks is located on the first floor near the entrances on both 33rd and 6th Avenue. Unlike some mall Starbucks that I’ve seen in my day, this one doesn’t have a seating area or separate lobby at all. It was literally built directly on top of the mall tile below the escalator to the second floor. It almost looks like a pop-up Starbucks — like they could clear out at any moment without a trace of ever being there. I would say I’d only recommend this Starbucks to someone up for some serious mall shopping, but then I really wouldn’t recommend coming to Manhattan to shop at a mall. Everyone’s heard of Chinatown, but what about Koreatown? Koreatown is a small Manhattan neighborhood in Midtown. It is just south of the giant Macy’s at Herald Square. This ethnic enclave is only three streets long, but it is simply brimming with culture. Last year I was led to this neighborhood blindly and told to expect one of the best meals of my life. That’s when I was introduced to Korean BBQ and was certainly not disappointed. Traditional Korean BBQ involves a charcoal grill built into your table as fresh meats and veggies are prepared for you table-side. Hibachi is child’s play compared to Korean BBQ. I highly recommend trying it. But anyway, this blog is about Starbucks, right? The Koreatown location at 33rd and 5th is a sizable location with just enough seating to quell the masses that pass through its doors. The decor is fairly simplistic and the furnishings are basic, but seating accommodations alone make this an above average location. I’d say come with a friend, a few friends, or just solo. You’ll be able to find a seat within minutes of entering.